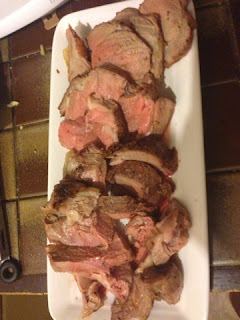 Lamb is such a treat in this household, so when the OH came home with a leg I couldn't wait to find a recipe. 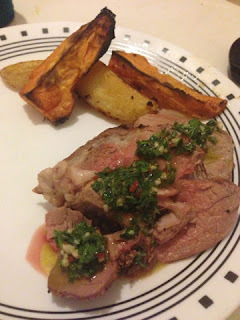 Chimichurri is something I have always loved but never attempted. Perhaps as the last time was at a friends barbeque and she did such a great job I just couldn't face it! It has now been 3 years and it was finally time. The mixture of the heat from the chilli and tartness of the vinegar is something that is just so delicious. 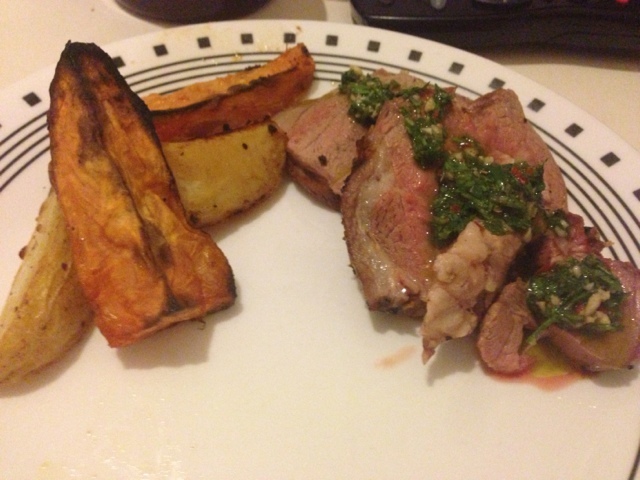 You can either use chimichurri as a marinade or a dipping sauce, I elected for the sauce and seasoned the lamb as per the recipe. Yay for Sunday night Lamb. The original lamb recipe had a mint sauce on the side which you can find on Jamie Online. Mix the crushed garlic, chopped rosemary, lemon zest and olive oil together. Season the lamb with salt and pepper and rub the marinade into it. Place on the hot bars of the oven above the tray. Boil the potatoes, simmer for 10 minutes and scuff the edges. 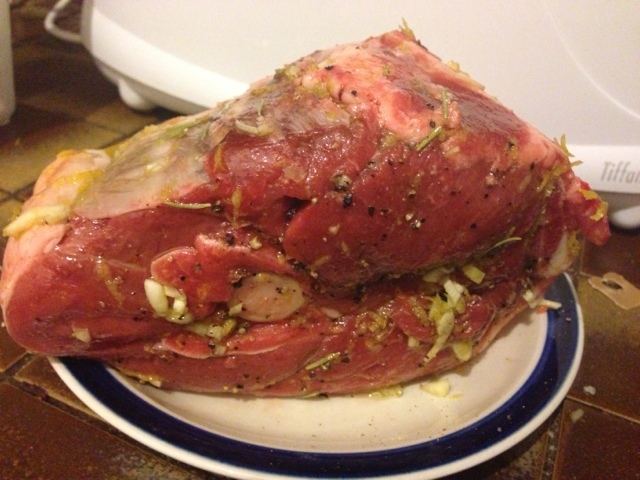 Add the rosemary sprigs and whole garlic cloves, season with salt and pepper and drizzle over a good lug of olive oil. Tip the potatoes into the tray and place under the lamb to catch all the lovely juices. To make the mint sauce, mix the chopped mint, sugar, salt, hot water and wine vinegar. Cook the lamb for about an hour and 15 minutes if you want it pink, or an hour and a half if you want it more well done. Take it out of the oven and cover with tinfoil and leave for 15 minutes before serving. Carve and serve with the potatoes and mint sauce. Tip: Try putting a few parsnips or carrots in with the roast potatoes. Add all ingredients to a food processor and add a little boiling water and whiz until smooth. Season to taste and pour into a bowl. I have omitted the mint sauce recipe as I did not use it, although if mint is more your thing you can find it on http://www.jamieoliver.com. Changes Made: I added some sweet potato along with the potato. As I did not have any new potatoes and mine were quite large I chopped them into wedges. Also, while I am growing to like coriander I don't yet love it, so substituted half for parsley. Also used 2 chillies, not one half. Results: Yum! The lamb was cooked perfectly and went well with the sauce. Next Time: More chilli, but thats just because I am a little obsessed.